← The Albigensian Crusades: Wars Like Any Other? 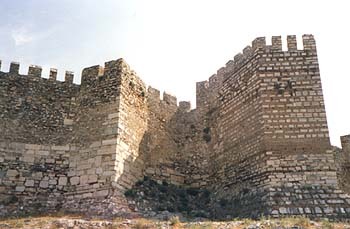 In 1992-warmly encouraged by Cyril Mango-Hugh Barnes and I, plus a team of Oxford undergraduates, began what is planned in the first instance to be a five-year survey of five Byzantine castles in the Menderes region of western Turkey) One basic goal of the project is to assemble material for a corpus of Byzantine castles that will contribute towards a more reliable chronology and typology of these sites, but the end of the exercise is not a study of Byzantine military architecture as such. Rather we see fortifications as a reflection of other aspects of the society which produced them. Byzantium is a relatively ill-documented culture, and castles are valuable evidence which we cannot afford to neglect. In this we are following a lead set by historians of western Europe where for the last two decades and more the study of castles has been a key field of research. A seminal work was that of Pierre Toubert published in 1973 which showed how between about 920 and 1030 the settlement pattern of the Latium region of central Italy was radically transformed around a series of fortified villages, each focused on a seigneurial castle. That transformation, termed by Toubert incastellamento, in tum brought with it a fundamental reshaping of the region’s social, political and economic structures. The change from a previously dispersed pattern of settlement owed virtually nothing to outside threats. This entry was posted in Articles and tagged Byzantine, castle, early medieval, fortifications, High Middle Ages. Bookmark the permalink.